The Northeast Corridor is the busiest railroad in North America by passenger traffic. This drone flight follows a high-speed Acela train making this 456 mile journey from Washington D.C. to Boston via Baltimore, Wilmington, Philadelphia, Trenton, Newark, New York City, Stamford, New Haven, and Providence. This animation was created using the Google Earth Pro desktop application. We began by tracing the full route of the Northeast Corridor onto three-dimensional satellite imagery of the world. We then programmed our computer to follow this route while running a screen-recording to capture the progress. Finishing edits were then made in Final Cut Pro, including the addition of the inset map at bottom, the speedometer and clock at upper left, and edits to the pacing and sound effects. The time and distance markers are calculated using Google Maps. The above animation is annotated, click here to view the uncut 28 minute drone flight. Audio effects are courtesy of Freesound.org. Published by the Gothamist on 22 January 2019. I have a love-hate relationship with the New York City subway, like many who claim to be citizens of Gotham. At rush hour, it is crowded, hot, and often slow. From years of riding its squeaky trains, it’s given me a permanent ringing tinnitus in my ear. But, it also represents the best of NYC and America. It’s this once public place where all social classes, all ethnicities, and all immigrants mix – where their normally separate lives are momentarily shared. Rich or poor, almost all of us ride the subway. 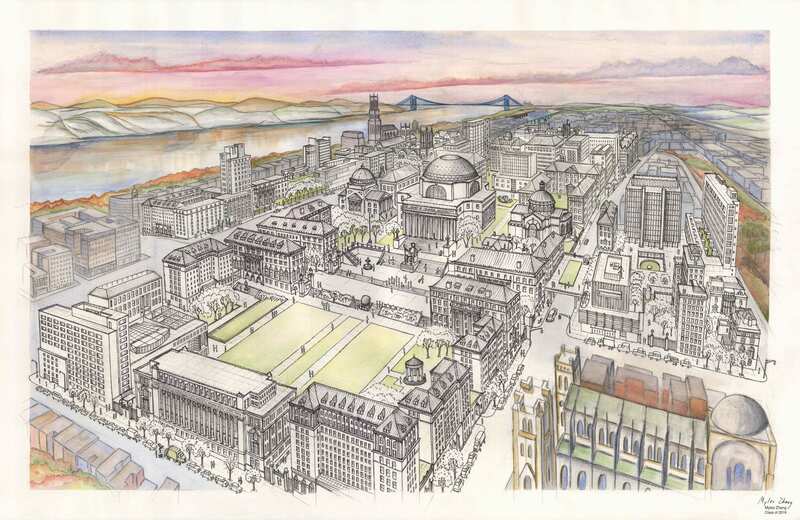 I’m an architectural history and urban studies undergraduate at Columbia University. Over the years and in classes, I encountered the theory that the mathematic theories of fluid dynamics can explain the causes of traffic jams. So, I began asking myself, how far can one extend the analogy that traffic is fluid? For instance, could the movement of people in the subway system be visualized as analogous to the rhythmic breathing of the human body? Linguistically, we often describe cities in terms of our bodies. For instance, major roads are described as “arteries” in reference to the human blood stream. The sewers are the city’s “bowels.” Or, Central Park is “the lungs of the city.” At various times in history, key industries like manufacturing were described as the “backbone” of the city’s economy. Cities are overwhelmingly complex organisms. But, this wordplay makes the giant metropolis somehow more human and familiar. I began this project after I realized that tourists are often overwhelmed by the large crowds and seeming messiness of public places like Times Square. In fact, this movement of people is highly ordered, structured, and rhythmic – as Manhattan’s population swells during the daily commute and then contracts by night. Give or take a few chokepoints, the system works. My hope is this animation renews people’s (and my own) appreciation for this engineering and the people behind it. Maybe the visual language of data can address this deeper need to humanize and soften this concrete jungle. Railroads, roads, and subways are New York City’s circulatory system. Every weekday, the subway transports 5.6 million and brings 2.5 million commuters to and from work (from 2017 stats). This daily rhythm of population growth and decline breathes economic life into this city. The Metropolitan Transit Authority (MTA) publishes data on the weekly and weekend (Saturday + Sunday) ridership at each of its ~425 stations. These statistics, updated yearly, are publicly available and can be analyzed to track trends in movement and urban growth. The MTA data is not georeferenced, and the NYC Open Data does not include ridership statistics. I therefore merged the georeferecned data from NYC Open Data with the ridership statistics from the MTA to create this animation. The MTA data was downloaded, analyzed, and then plotted onto the city map. Dots are color-coded according to the subway lines they serve. White dots are for junctions between two or more lines. Dot size corresponds to the number of riders who swipe into each station with their metro card during each 24-hour period. Larger dots are for busier stations; smaller dots are for less busy stations. Commuting patterns are analogous to the rhythmic expansion and contraction of the human body while breathing. By contrasting weekday and weekend ridership patterns, we detect the city’s respiratory system. Each passenger symbolizes the movement of a single blood cell, operating as one cellular unit in a complex system. Click here to download the infographic above. Where in the world is modernism? What if the nationality of every artist represented in the Museum of Modern Art’s collections could be mapped to illustrate the Museum’s geographic diversity through time? Watch the data visualization below of 121,823 artworks at MoMA. “The Museum of Modern Art (MoMA) acquired its first artworks in 1929, the year it was established. Today, the Museum’s evolving collection contains almost 200,000 works from around the world spanning the last 150 years. The collection includes an ever-expanding range of visual expression, including painting, sculpture, printmaking, drawing, photography, architecture, design, film, and media and performance art. “The Artists dataset contains 15,757 records, representing all the artists who have work in MoMA’s collection and have been cataloged in our database. It includes basic metadata for each artist, including name, nationality, gender, birth year, death year, Wiki QID, and Getty ULAN ID.” – from MoMA’s website. What can big data reveal about the history of curating and the growth of museum collections? The results are presented below in three case studies with accompanying infographics. Hover over the graph or toggle the buttons to explore the data in depth. The map below visualizes the nationalities of ~15,757 artists whose work is displayed at MoMA. There are 121,823 data points below. The data can be browsed by year or by department. This illustrates the constantly evolving geographic breadth of collections. Beginning in the 1930s, over 80% of artworks were from the four key countries of the US, UK, France, and Germany. Beginning the 1960s, the museum acquired some of its first works from Latin America and Japan. And, post-1991, the museum acquired the bulk of its collections from Russia and China. Recent years have seen a slight growth in African art. An important distinction: This map does not show where each artwork was made. Rather, it shows where each artist is from. Nationality and national identity are, depending on the artist, an important influence shaping the unique perspective artists bring to their work. The bar chart below shows the gender distribution of artworks by date. On the horizontal axis: the date acquired. On the vertical axis: the number of artworks acquired in this year. Each bar is divided into three colors: Blue for artwork by a male artist. Pink for art by a female artist. Grey for art where the gender of the artist is not known. This data can be explored by year and by department. Across departments, male artists comprise the large majority of holdings. The departments with the greatest number of works by female artists: Photography and Drawings. The department with the least female representation: Prints & Illustrated Books. The department with greatest number of works where the artists’ gender is unknown: Architecture & Design. However, across departments, the representation of female artists has slightly increased over the past few decades from around 0% to somewhere closer to 20%. Do newer acquisitions tend to be smaller? The two graphs below plot the relationship between year produced, year acquired by MoMA, and the dimensions of each artwork (width in cm). I’ve plotted 12,250 points. They are color coded with the same blue, pink, and grey system as the previous chart. In the first graph, we see how new artworks are becoming progressively larger and larger. In 1929, the year of MoMA’s founding, the width of the average work being produced was less than 100cm. Today, the average width of newly produced works in the collection is around 400cm – and is steadily increasing. In the second graph, we see how MoMA’s new acquisitions are becoming progressively smaller, even though newly produced artworks are larger than before. In 1929, the average width of a new acquisition was over 300 cm. Today, the width is less than 150cm. Contemporary artists seem to be working in ever larger dimensions – at least the contemporary artists whose work MoMA acquires. But, newer acquisitions tend to be smaller. Does this reverse correlation indicate that the growing costs of buying and storing art have priced MoMA out of larger artworks? What is the relationship between size and the decision whether or not to acquire a work? Is the scope and definition of modernism expanding to include older artworks? The graph below compares the relationship between production year and acquisition year for 7,797 items. The red trend line is the average of the acquisition (horizontal) and production (vertical) axes. Dot color indicates gender. Dot size indicates the number of works by this artist acquired in this year. In 1929, most new acquisitions were produced in the 1920s – modernism was a new movement and a new idea. Today, new acquisitions range in date from the late 1800s to the early 2000s – the definition of modernism has grown to encompass both newer and older works. But, the average date of new acquisitions is between 1950 and 1960. There is modern art recently produced, and then there is modern art that is not as new but can reveal the history and birth of “modernism.” This is, so to speak, the history of the present. Modernism is not a geographically limited phenomenon. With globalization and the march of capitalism, the area effected by modernity is growing. And as new regions of the world come into contact with modern technology, materials, and ideas, the qualities of their respective art and the practices of their artists will change. Cultural institutions, particularly museums dedicated to modern art, are positioned to curate these global trends through the kinds of works they acquire and display in their galleries. More broadly speaking, the kinds of stories museums and curators can tell about history may reflect the geographic, gender, and temporal strengths (or weaknesses) of their collections. MoMA’s dataset from GitHub is free to download here. It is published with the following license: Creative Commons Public Domain (CC0). The information presented above reflects this dataset as of 17 October 2018. New entries after this date are not included as these infographics are not updated in real-time. The dataset, derived from MoMA’s, is also free to download here from Tableau Public. These infographics are not affiliated with MoMA. MoMA does not endorse the conclusions of the authors, who themselves take sole responsibility. The conclusions presented below are limited by the scope of MoMA’s published metadata. This author is aware that, according to some definitions, gender is not a binary. Yet, the colors pink and blue code for traditional gender norms. This color palette is for visual clarity; it does not represent an endorsement or rejection of this gender binary. What can a data analysis of New York City’s landmarks reveal about trends in the historic preservation movement? The video above is a visual history of landmarks preservation in New York City. There is an ongoing debate between in New York City between developers seeking to rebuild the city in the image of global capitalism and preservationists seeking to slow the rate of change and protect the appearance of the city’s many and distinct neighborhoods. This debate plays out every year in the hundreds of buildings and structures that are added to (or rejected from) the Landmarks Preservation Commission’s running list of landmarks (LPC). Once added, landmarked buildings cannot be modified without first seeking approval from the city. And, to date, there is no process for de-listing a landmark once added – unless (sometimes intentional) decay by neglect requires demolition. This aspect of preservation is particularly contentious for developers because the legal barriers of preservation law are permanent, binding, and affect all current occupants and future owners. Historic preservationists are the arbiters of taste. The sites they preserve will become the aesthetic lens through which future generations will appreciate the city’s past. The sites they do not preserve or neglect to protect from demolition will be lost to history – no longer a living testimony to vanished builders, architects, and immigrants. On the individual scale, preservation is about protecting structures of value. On the larger scale, preservation is part of a larger historical debate: Which aspects of the past are worth preserving? And what kinds of narratives can historians tell about cities, based on the material evidence that survives? In this debate, there are many factors driving preservation: fear of losing heritage, fear of change, well-intentioned activists in the spirit of Jane Jacobs and NIMBYism, or concerned scholars and public servants who see something unique in the sites they add. The objective of this paper is to assess arguments made in favor of or against historic preservation through an analysis of publicly-available landmark records from the New York City Open Data website. We identified two datasets, both containing ~130,000 spreadsheet entries for every single LPC listing. The first dataset is entitled “Individual Landmarks” 1 and describes the date entered in the LPC database, the address, lot-size, the geographical coordinates of every single structure, etc. The second dataset is entitled “LPC Individual Landmark and Historic District Building Database” 2 and includes the construction date, original use, style, and address of all structures. We downloaded these two datasets as .csv files, imported them into mapping software called Tableau Public, merged them into a single file, and then conducted a data analysis – the results of which inform all the statistics presented here and drive the conclusions drawn in the following pages. From this research methodology, we identify heretofore hidden trends in historic preservation. Firstly, we identify contextual preservation and historic districts as a means to protect the human scale of neighborhoods. Secondly, we identify a marked and potentially unjustifiable preference of preservationists for protecting pre-1945 structures. And thirdly, our data hints at the strength of market forces and developers in shaping the scope of preservation. Above is a tree map of the distribution of the 128,594 landmarks across the five boroughs. This includes both buildings and non-buildings, like street lamps, parks, statues, etc. The size of each rectangle corresponds to the number landmarks within one historic district. Or, in the case of the largest rectangle for each borough, the box represents the number of individual landmarks outside historic districts for that borough. The size of the box reflects the number of buildings within each district – the larger the box, the more buildings within that category. Each historic district is color-coded by borough and grouped alongside all the other districts within that borough. Manhattan. Brooklyn. Queens. Bronx. Staten Island. At first glance, we notice several trends. The densities and locations of preserved districts do not correspond to the most densely populated areas. For instance, Manhattan, with population only 19.3% of the citywide total, 3 has 30.46% of the landmarks. By comparison, Staten Island, with only 5.55% of the population, has 16.24% of landmarks – the greatest per capita number for all five boroughs. Or, the Bronx with 17.06% of people has only 5.36% – the lowest per capita. Given that the land area of Bronx (42.47 mi²) is comparable to Staten Island (58.69 mi²), and given that their histories are equally rich, then does the Bronx objectively have fewer landmarks worth preserving? Or, do preservation trends follow patterns of economics and race – with economically advantaged neighborhoods having stronger legal and political leverage to maintain and restore the appearance of their architectural heritage? Historic preservation does not operate off of a tabula rasa with objective standards and processes for listing, despite appearances to the contrary. There is an undeniably spatial pattern to urban growth and income inequality with a city segregated into districts by age of construction, race, and income. Historic preservation may operate on this unequal economic fabric. Developers often claim that historic preservation discourages development and reduces the potential of land to be profitably developed. To support this, developers will acknowledge that there doubtless are structures worth preserving, but that the same legal protections extended to genuinely historic structures are also extended to their less-significant neighbors. This criticism of preservation applies to vacant parcels within historic districts or more modern buildings that are surrounded by historic ones. Our data does not support this claim. Within the city’s unequal fabric with pockets of concentrated, wealth, poverty, and history, we identify three general categories of protected buildings. First, there are individual landmarks, such as bridges, large railroad stations, statues, or street furniture. While aesthetically and historically important, these individual sites are rarely adjacent to other landmarks. Also, new development can occur adjacent with few restrictions on zoning. No approval from the LPC is necessary – only construction permits and variances as needed. The case for preserving these structures is strong, as application for each was individually made and individually approved on a case-by-case basis by city government and often with approval from the landowner at time of designation. Grand Central Station and Saint Patrick’s Cathedral are two examples. These structures, on account of their height, size, or appearance are genuine landmarks and place-makers in defining neighborhood identity. 303 President Street, Carroll Gardens: The brownstone in center used to resemble its neighbors but was modified before the neighborhood was transformed into a historic district in 1973. 55 West 83rd Street, Upper West Side: This c.1950 building on left has no historic value, but it is surrounded by historic structures on either side and across the street. Hence, the legal protection for the neighbors is extended to this building. Third, there are contributing and vacant parcels within these historic districts. The protections applied to category two buildings are extended to category three on the grounds that development on these less important sites will affect the quality and aesthetics of adjacent structures. The best example of this kind of contextual preservation comes in the form of a series of structures. Most may retain their original appearance, but a few interspersed between post-date the neighborhood’s age, are built in a different style, or suffered from demolition before the area was preserved. Above are two examples of these kinds of contributing structures. Case Study Three: Keeping up to pace? When the first batch of 2,312 historic structures was landmarked in 1965, their average year of construction was 1882 – representing an 83-year gap during which these structures were not protected. In 2018, the average construction year of newly landmarked structures is 1908, representing a 110-year gap. Thus in the 53 year life of the landmarks movement from1965 to 2018, the average age of a building when landmarked has increased by 37 years. The more recent inclusion of modernist skyscrapers, like the Lever House (1982) and Seagram Building (1989), may give the impression that the criteria for what qualifies as aesthetically important and worth preserving has expanded. Our data does not support this conclusion, because while recent years have seen newer landmarks granted legal status, the rate of designation has not kept up with the rate of construction and, in fact, has fallen behind. The graph below illustrates the date a structure was registered on the horizontal axis measured against its construction date on the vertical axis. Every single protected structure is plotted on this graph by color. Individual dots represent individual sites. The black trend line indicates the only moderate increase in the numbers of modern structures receiving protection. Is historic preservation falling behind, even though the rate of construction and population has increased? Or, is the city no longer building the kinds of structures deemed worthy of preservation? This 16-year gap could be a fluke, or it could be indicative of larger trends. To qualify for landmark status in NYC, a building must be older than 30 years or older than 50 if added to the National Register. From a publication by the The Trust for Architectural Easements: “LPC property must be at least 30 years old – no exceptions – whereas a National Register property must be at least 50 years old, unless it is found to be of exceptional significance, in which case there is no age limit at all.” 10 When the LPC was formed in 1965, none of the buildings from 1935 to 1965 would have qualified for designation. Today, as of 2018, any building from before 1988 could qualify. However, less than 5% of all listed structures date from the 43 years from 1945 to 1988 – a significant time in this metropolis’ history as it transitioned from an industrial economy to the world’s financial center and a major hub for tourism. The graph below illustrates the age range of all landmarks and the distribution of landmarks by year. The horizontal axis corresponds to years, and the vertical axis represents the number of landmarks built in that year that are now included in LPC listings. Clearly, the vast majority falls within the 90-year span of 1850 to 1940, with few landmarks falling outside this range. The peak is in 1895 with 13,275 records from this year alone – a surprising anomaly. The rise and falls on this graph may also correspond to roughly 20-year periods of boom and bust recessions, along with corresponding halts to new construction. The shortage of pre-1850 sites is easily explained by the vagaries of time and the relatively smaller size of the city before 1850. But, the chronic shortage post-1940 may hint at a broader historical oversight or change in the way new buildings are designed and age. The LPC was created partially in response to the demolition of New York Penn Station in 1963. And, it was an attempt to prevent further destruction of aesthetically significant buildings, many of which had already been lost to progress and urban renewal. By the 1960s, urban renewal was winding down and New York was entering the prolonged recession of the 1970s and 80s, during which the rate of urban renewal and highway construction ground to a halt. In this light, the LPC originated as a post-facto response to demolition that had been going on for decades. Despite the history of the LPC, must land marking occur after destruction has begun? There are doubtless hundreds of post-war buildings of significance – that have not yet been identified or deemed worthy. The question is not: Should we list these buildings? Rather, the question should be: Why are we not listing these buildings before they are threatened? And why should LPC status be limited to buildings older than 30 years? The demolition of the city’s American Folk Art Museum by MoMA in 2014 is one example. 11 The Temple of Dendur and its custom-built exhibit hall is another instance of an interior landmark completed pre-1988 and potentially eligible for LPC status. How might the preservation movement reflect economic patterns? The most salient figure in the above table is the disproportionate representation of residential and civic buildings that are preserved. For instance, as of 2018, Manhattan has 39,172 landmarked items. Of these landmarks, 35% (= 13,816) are residential use, 9% (= 3,443) are commercial, and 1.5% (= 650) are mixed-use. Mixed use, in this case, is defined by commercial on the lower level and offices or residential on upper floors. However, there are more commercial and mixed-use buildings in Manhattan than there are residential buildings. 13 So, the percentages of landmarked buildings are not representative of the percentage of residential versus commercial and mixed-use buildings that exist. In short, our data supports the conclusion that residential buildings seem more likely to receive landmarked status than commercial structures. The numbers of landmarked civic structures strengthens the above conclusion. New York City owns 14,000 properties 14 across five boroughs. This MAS estimate does not include public monuments, statues, civic buildings built by the city and later sold, or civic buildings originally built for private use but acquired by the city. Yet, there are 16,920 landmarks designated as serving “civic” functions, including 11,726 landmarked items relating to hospitals and 571 related to armories. In fact, among all the 440 types of landmarks in this city, civic-related structures have the highest rates of landmark status and the rate of preservation closest to 100%. What explains these inequalities? One explanation could be that civic sites, particularly those built in the early 20th century tend to be high quality, well built, and designed to articulate the civic values of democracy and government through the beauty of the neoclassical style. Therefore, these buildings are more likely to be deemed worthy of preservation. But, this interpretation is doubtful because there is little factual basis to assume that civic structures are “better than” commercial and mixed-use. A more believable explanation could be that civic and residential structures are easier to landmark than commercial. The maintenance and upkeep of civic structures is managed by government and elected officials, who are responsible to voter complaints and community pressure. And, the public can threaten to vote out of office any leaders who neglect historic, city-owned properties. Additionally, there are few reasons for developers or residents to object to land-marking civic sites, as legally protecting these structures adds more red tape, not to city residents, but to the future bureaucrats who restore these sites. Again, this is speculation. Still yet, there is a stronger factor influencing preservation. Civic structures are not subject to market pressures, and city-owned buildings do not have to help their occupants make a profit. For instance, the cost of rehabbing a historic public school building might more expensive than just demolishing and rebuilding it new, but the city is under less pressure to demolish the structure because, fortunately, city government is not run like a profit-driven corporation. 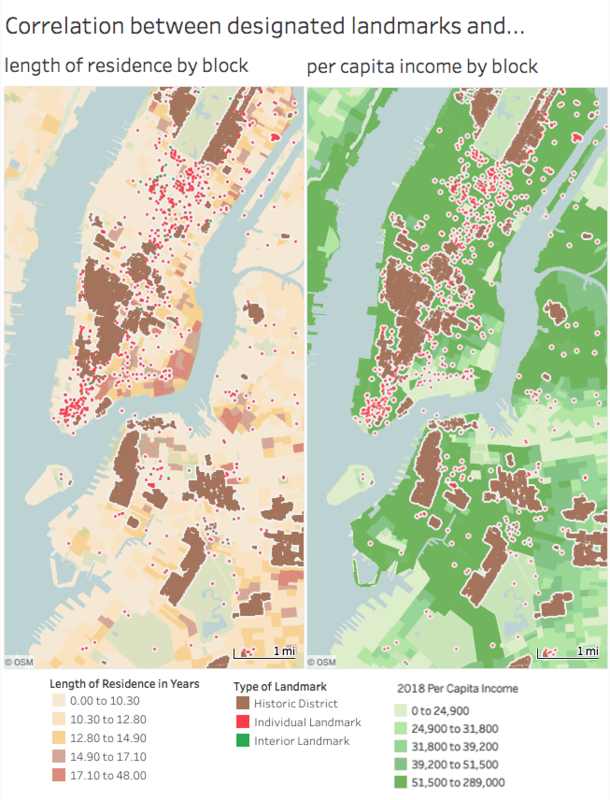 And, so historically valuable but functionally outdated city buildings may be more likely to be landmarked and restored than demolished, as illustrated by the unequal distribution of building types in our data. By contrast, commercial and residential structures are subject to strong market pressures favoring demolition. An old factory that has outlived its designed lifespan and is no long suitable for modern-day production line assembly will be abandoned or demolished if it cannot be converted. But, the process of conversion may require completely gutting the structure, environmental remediation, and a lengthy approvals process. If the cost of renovation is more expensive than the income the renovated structure can bring in, then there will be greater pressure to demolish than to preserve the fated structure. City-owned libraries and hospitals face less of this kind of pressure. What explains the disproportionate protection of residential structures? One possible motivating factor could be income-levels in historic neighborhoods and associated protectionism. The map on the following page overlays the locations of historic districts over 2018 block-level census data for income levels and length of residence. Our analysis reveals a spatial overlap between historic districts and areas with higher incomes and longer-term residents. For instance, the average length of residence for residents in the Brooklyn Heights historic district is between 17.1 and 48 years and incomes range between $51,500 and $289,000, while the rest of Brooklyn averages between 10.3 and 12.8 years and under $51,500 income. Similar patterns play out in the Greenwich Village and the Upper West Side. In short, residents in historic neighborhoods seem more likely to stay-put, and length of residency may be a proxy for measuring the degree to which residents are invested in maintaining the physical appearance and improving their community. From this data, we posit that the relationship between historic preservation and length of residency is too strong and too consistent across the five boroughs to be correlation. There may be causative factors at play between income, emotional investment in one’s community, and preservation, yet this remains to be conclusively confirmed by future data. Click map to launch interactivity − opens in new tab. Individual landmarks in red outside historic districts in brown tend to be commercial structures. and the income levels of their adjacent community. The spatial relationship illustrated above is surprising for another reason: gentrification. Normally, gentrification in the past 20 years is associated with rising income levels and the displacement of existing residents. The physical appearance of historic neighborhoods should also make them more desirable for gentrification. However, the average length of residency is longer in historic than in non-historic districts, even though income (and presumably rent, too) are higher in historic districts. That is, neighborhoods with historic preservation more often have high and rising incomes with long length of residency. This seems contradictory because high-income areas should be more likely to push out longer-term tenants from the pre-gentrification era. By contrast, neighborhoods without the benefit of historic preservation more often have high incomes and lower length of residency, meaning a high turnover rate. The Williamsburg neighborhood is one example with incomes over $51,500 (similar to Brooklyn Heights) but length of residency under 10.3 years. Additional research should examine if rent-stabilized apartments are more likely to be concentrated in historic districts. There is the possibility that the legal barriers of preservation make it more difficult for developers to push out existing residents, gut an old building, and then rebuild it to charge higher rent. Unfortunately, New York City Open Data has no information on the spread or geographical clustering of rent stabilized apartments. These possible relationships between historic preservation and gentrification need to be confirmed by further analysis. There are limits to our data – these statistics cannot reveal the intricacy of historic sites, the unique identity of each, or the reasons why each justify (or do not justify) protection. But, this data can reveal big picture trends in preservation, its biases, and some of its problems. While these trends are not visible from walking the street or looking at individual sites, they become visible through the lens of data. This data may also reveal causative relationships between income, length of residency, and the political strength of preservationists. Historic preservationists prefer to landmark and protect pre-WWII buildings, even though numerous post-war examples may qualify. As a result, there are a disproportionately high number of pre-war buildings with landmark status, and comparably few post-war landmarks – less than 5%. Similarly, the rate at which landmarks are designated has not kept up with the pace of new construction. The market pressures to demolish civic structures are weaker than the market pressures to demolish commercial and residential. As a result, a disproportionately high percentage of city-owned or institutional buildings are preserved, and a disproportionately low percentage of commercial and industrial. Tangent to the previous point, a disproportionately high percentage of landmarks are for residential use and fall within residential districts. This may indicate that landmarks preservation is a strategy for neighborhood protectionism – that is, an effort by residents to ensure that the appearance of their community is not changed due to new development. Neighborhoods of lower-density old buildings, like the West Village, retain their popularity, charm, and high property values thanks to strong legal barriers against change that could lead property values to depreciate. While these barriers may discourage and prevent developers from reaping larger profits by building higher and larger, they also ensure that existing residents’ investment in their condos or homes will remain more stable. History is for losers. By that I mean, cities which have chosen to preserve all their historical monuments and locations usually do so because no one else wants the land to develop. Modern progress has passed them by. New York’s history doesn’t litter the streets visually, it can be hard to find sometimes, but that is because the city is an economic winner on a global scale. New York is indeed a winner “on a global scale,” with Wall Street as a symbol of America’s economic power, the United Nations as a symbol of political power, and the city’s over three million foreign born as representative of power of immigration and globalization to shape a city. But, this progress comes at a historic and aesthetic cost – the consequences of which are reflected in the dark and sterile skyscraper canyons of Midtown, the worsening congestion in cars and subways, and (more pressingly) this city’s fragility when faced with ecological pressures, such as flooding, hurricanes, and climate change. At the level of historic preservation, this progress comes at the cost of losing New York’s distinctive architectural heritage to the force of globalized change. The Gilded Age mansions on Fifth Avenue and the built-to-last-forever Penn Station are gone, as are the picturesque skylines and distinctive ethnic neighborhoods of Berenice Abbott’s 1930s photographs. The New York of today is different – whether it is architecturally poorer for progress can only be judged in retrospect. Historians prefer not to speak of what-ifs when writing about history, but would it have been possible to accept the benefits of progress without sacrificing history? This, however, is a question beyond the limits of data to contemplate. This author is not affiliated in any way with NYC Open Data, LPC, or the New York City government. Through Penn Station one entered the city like a god. Perhaps it was really too much. One scuttles in now like a rat. Human beings, myself included, have an unfortunate tendency to appreciate people and things only after they are gone. Pennsylvania Station is the catalyst for the historic preservation movement. The old Penn Station, completed 1910, had 21 tracks on 11 platforms. The new Penn Station has 21 tracks on 11 platforms. In the demolition process, not one track or platform moved. This similarity enables us to situate parts of the old structure in relation to the new. The photos below compare this structure past and present. The old photos are drawn from the digital archive of the New York Public Library, Historic American Buildings Survey, and Library of Congress. The current photos were all taken by Myles Zhang in March 2019. Current photos are as close as possible to the original camera angles. However, some changes in the station layout and access rights to the areas above make complete accuracy prohibitively difficult. 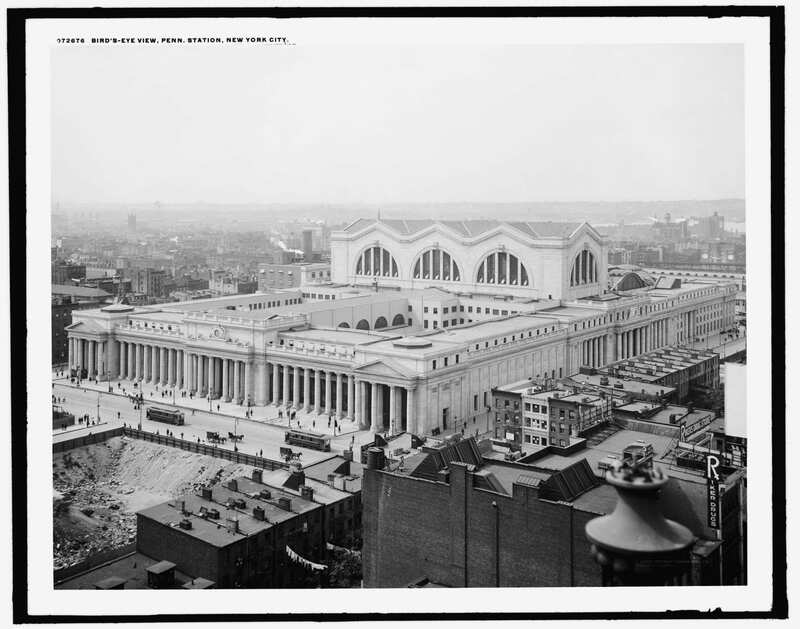 Curious how New York Penn Station influenced landmarks preservation? See this video from Khan Academy. We begin our approach to old Penn Station at the intersection of Seventh Avenue and 32nd Street. When the station opened in 1910, and before the subway lines were extended south along Seventh and Eighth Avenue, this was the main axis of approach. A temple front with six solid stone columns and a rectangular pediment above greeted visitors. Three eagles adorned either side of the clock, six total. After demolition, two of these eagles survive and are now placed on concrete pedestals in the adjacent plaza. Originally, one entered Penn Station at street level. Now, one descends about 20 feet to an underground corridor. This is the same entrance, viewed head-on from 32nd Street. Beneath this street, the Pennsylvania Railroad constructed its double-track tunnels stretching from here to Sunnyside Yard in Queens, and onward to destinations in New England and Long Island. These two tunnels survive, but everything above ground does not. This is the view from the 31st Street side between Seventh and Eighth Avenue. The mass of the main waiting hall rises in the center, as indicated by the arched thermal window. The colonnade at center left corresponds to the taxi and car drop-off and pick-up area. After demolition, developers erected the round mass of Madison Square Garden on the foundations of the former waiting hall and train concourse. This is the view from the corner of 31st Street and Seventh Avenue. Contrary to appearances, the old structure was entirely steel frame with limestone and granite facing. Only the columns on the main façades were solid stone. By the 1960s, the structure was sooty with car exhaust, as seen in the above photo from 33rd Street and Seventh Avenue. The rest, however, was in excellent condition. After entering Penn Station from the Seventh Avenue side, a long vaulted shopping arcade greeted visitors. The shops here were the only source of outside income for the railroad at this location. In later years, the shops did not even provide enough rent to cover the $2.5 million spent yearly on upkeep (1961 value from Ballon on p.99). Considering the size of this double-block and its prime location in Midtown, the old Penn Station generated precious little income for its owner. Currently, the lobby of Penn Plaza occupies this location — an office building with 700,000 square feet of space. Formerly public space is now rendered private. Also, note the statue of Alexander Cassatt at center right (President of the Pennsylvania Railroad). Proceeding down the arcade, one entered into the main waiting hall — a vaulted space about 150 feet high by ~300 feet wide. One descended a wide pair of stairs — note the statue of Cassatt in the niche. This was one of the largest internal public spaces in the city. This is the door into the restaurant. The arcade is on the left hand side. The stairs descending to the waiting hall are on the right hand side. Hilary Ballon writes that this “vestibule was a transitional space; it was dimly lit and nearly square to counter the directional force of the rooms on either side. It provided a moment to pause and prepare for the grand descent into the waiting hall” (p.62). This part of the building now roughly corresponds to a sub-basement buried below the walkway linking Penn Plaza to Madison Square Garden. This is the view down into the waiting hall. The coffered ceiling and thermal windows are modeled on the Baths of Caracalla in Rome. In the rectangular panel beneath these windows are maps of the United States and the rail networks of the Pennsylvania and Long Island Railroad. Contrary to appearances, this space contains little stone. The entire frame and support structure is of steel beams with plaster above (for the vaults) or thin limestone panels (for the walls). Ballon writes: “For those approaching from the arcade, the directional contrast in the waiting hall also created a sense of space exploding horizontally. The freestanding fluted Corinthian columns and robust curls of the acanthus leaves, the strongly projecting entablature blocks, and layered ceiling offers these sculptural features made the weightless volume of the waiting hall seem weighty. Like the plenitude of a sheltering night sky, the enormous space was both humbling and uplifting” (p.64). Here’s the view back up the grand stairs, this time from the waiting hall toward the arcade. The original Penn Station had no escalators from tracks to concourse or waiting areas to street level. Passengers would have had to carry their luggage up and down steep stairs; the architects of Grand Central observed this problem at Penn Station. Grand Central has ramps instead of stairs to ease movement between levels. The escalator shown in this 1960s photo is a later addition. This is the waiting hall in the 1962, months before demolition began. The roof and walls are visibly sooty. Where this space once stood is now a parking lot for trucks and buses using the loading dock beneath Madison Square Garden. The wall of windows at left is Penn Plaza. The sliver of building at right is the Garden. This older photo was taken in the morning, as the sun rose over New York, penetrating the east-facing windows, and illuminating the waiting hall. Most of the old station’s public areas and track level were touched by natural light. By comparison, no natural light enters any part of the new Penn Station. Currently, this area is a difficult-to-access parking lot — patrolled by armed guards with bomb-sniffing dogs. After passing through the waiting hall, visitors entered the train concourse. This was also a massive room, bathed in natural light, about ~300 feet long, ~200 feet wide, and 90 feet tall. From here, large chalkboard signage (erased and written manually) directed passengers to their right track. The above photo shows the two levels — the lower for arrivals and the upper for departures. Ballon describes the end of this journey from arcade, to waiting hall, to concourse: “The spatial compression directed attention down to the tracks, where were illuminated by natural light and visible through the cut-away floor. The vista of the sky above and tracks below created a sense of transparency in the concourse, as if the visitor was seeing with x-ray vision” (p.68). This 1930s photo by Berenice Abbott shows the intricate web of ironwork supporting the skylights. This is the view northwards from the 31st Street entrance to the train concourse. This photo now corresponds to the VIP entrance for spectators at Madison Square Garden. Here is the concourse again. In the old photo, the left exit leads to 33rd Street while the larger and arched right exit leads to the waiting hall and a baggage concourse. No trace of the old structure remains in the new photo. This is still a train concourse — except now with oppressive drop ceiling and exits to Amtrak trains. Many of New York’s greatest landmarks feature Guastavino Tile vaults. Penn Station too. The main area of the train concourse was covered with glass. But, the lateral row of vaults with an oculus in the center of each was made of Guastavino. No trace of these self-supporting terracotta tiles survive at Penn Station, except for a single vault at the southern exit for the local southbound One Train. This is the view from Track Six up past the lower concourse for arriving passengers, the upper concourse for departures, and toward the glass vaults. When this structure was demolished, Madison Square Garden was erected on the exact same bedrock foundations. 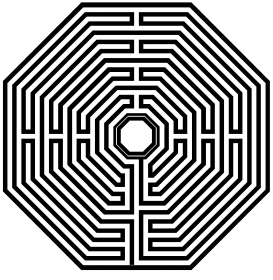 The locations or number of tracks did not change, nor have the locations, width, or size of almost all stairwells. As seen in these photos, a few new supports were added to support the now much heavier structure above. The failure to rebuild the now grossly inadequate Penn Station is not about lack of money. Built for 200,000 commuters in 1910, today, 650,000 people go through Penn Station each day, more than the daily passengers for all three major New York City-area airports combined. The failure to rebuild is not about lack of demand either; these numbers are expected to continue growing. This is, more than anything, a failure of political will and a lack of interest in sustaining and improving the nation’s critical rail infrastructure. The current station makes a profit for its management — from the stadium and offices above. Any new station that restores natural light to track-level and revalues the passenger experience over profit is unlikely to be as lucrative. Few tangible profits are to be made from beauty. Over the past few years, the Metropolitan Museum has catalogued over 25% of its holdings online. This represents ~590,000 objects, covering over 5,000 years of human history from 17 curatorial departments. The diversity of objects in a museum’s collection (and the amount of contextual information known about these objects) may reflect the kinds of narratives a museum can curate about artistic and global history. This animation charts the provenance and year of production of every single object that is catalogued on the Metropolian Museum website, whenever this information is known. In this animation, each colored dot indicates one geographical location represented by art in the Met’s online collection. The dot’s location indicates where this object was created. The dot’s size corresponds to the number of objects from this location. The time each dot appears corresponds to the year this object was created. Collectively this animation reveals the potential geographical and temporal preferences of the Met’s online inventories for objects collected in the common era (the year 1 c.e. to present-day). The dots above are assumed to be a relatively accurate sample size. However, there are many objects in the collections with known provenance but unknown production date. Figure 1 below illustrates objects with known provenance and known year. Figure 2 shows objects with known provenance, regardless of whether year is known. The data-set in figure 2 has approximately double the number of objects, but these are concentrated in the same regions as objects in figure 1. This is because objects with known year also tend to have known provenance. Hence, figures 1 and 2 exhibit similar tendencies. Figure 1: All art with known provenance AND known year. Art objects from ancient cultures like China, Egypt, and Sumeria frequently have known provenance but unknown year of production. This year might be estimated to the level of century with the help of carbon dating and through comparison with similar objects whose date is known for certain. Were the dates of these ancient objects known for certain, they could have been included in the animation above, thereby increasing the size and density of dots in under-represented regions. In this case, the animation would have resembled figure 2. There is one more interpretive problem: Does this visualization reveal more about the diversity of the collections, or the preferences for which objects are selected for inventory online? For instance, does the statistical absence of objects from East Asia, in comparison to France, mean that the Met collects objects from East Asia less actively and in fewer quantities? Or, does this absence merely mean that fewer objects from the East Asian collections are selected for display on the museum website? Metadata for this animation was downloaded here from the Met Museum’s website, then edited as a spreadsheet in excel and visualized in Tableau Public. This data was published by the museum staff in the public domain under a Creative Commons license. I am also publishing this visualization as an interactive map; it is open source and free to download at this link. 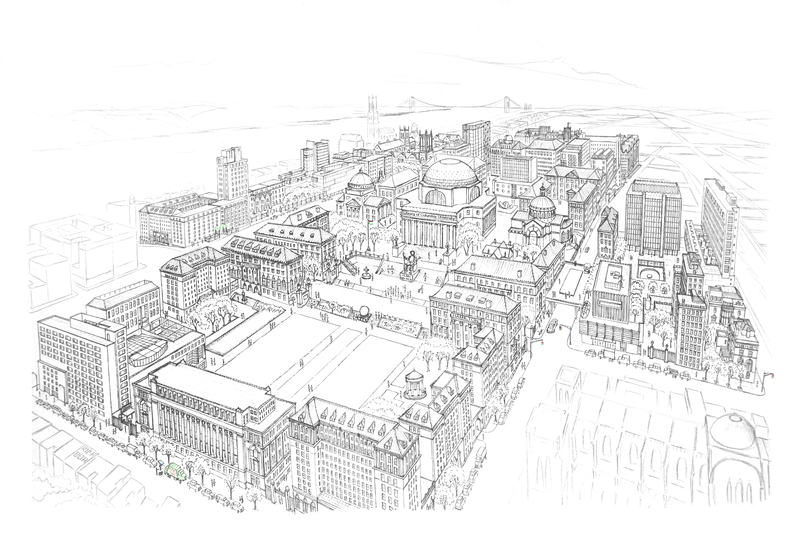 This drawing depicts every building, window, tree, and architectural detail on campus as visible from an imaginary perspective 500 feet above the intersection of 110th and Amsterdam and looking northwest toward campus. The number of windows on each facade and details are faithful to reality. There are about 2,000 windows in this image and about 50,000 individual lines. The image measures 26 by 40 inches and is framed in my room on campus. The personal objective of this project was to create a souvenir through which to remember my formative experiences and time at Columbia.I draw the little world I find at Columbia so that, years from my graduation date, I can look at this image and reflect on the formative four years I spent here. The perspective in this image was formed by using Google Earth satellite photos combined with information extracted from Google Maps street view. To read an interview and article about this project: click here. Ink Drawing of Columbia University. Measures 26 by 40 inches. Click image to launch full resolution. Before my first day as a Columbia College first-year, I assembled a miniature model of Columbia’s campus out of folded paper and cardboard. This creation, featuring most of Columbia’s Morningside campus, folds out of a vintage cigar box that measures a mere 5 by 9 inches, and 3 inches deep. The model was made by taking flat sheets of paper, etching the silhouettes of the campus structures onto each sheet, decorating these sheets with windows and architectural details, and then finally cutting out the silhouettes and folding each into the shape of the structure. Each building is made with no more than one sheet of folded paper. This is a project of six time-lapse sequences of Columbia. I placed a camera horizontally above my desk as I draw and paint each watercolor. Painting is meditative for me, and each painting an opportunity to reflect on my formative time at Columbia University. The film featured below illustrates the opening and closing sequence of an early canal lock: The Duke’s Lock on the Oxford Canal. “The Oxford Canal is a 78-mile (126 km) narrow canal in central England linking Oxford with Bedworth, near Coventry. Completed in stages between 1770 and 1790 during the English Industrial Revolution, it connects to the River Thames at Oxford and is integrated with the Grand Union Canal. The canal was for approximately 15 years the main canal artery of trade between the Midlands and London; it retained importance in its local county economies and that of Berkshire. This four minute animation traces the evolution of English country house design from the period 1660 to 1715, which was broadly defined by the arhcitectural style of the English Baroque. Roughly between 1660 (near the end of the English Civil War) and 1715 (with the beginning of the Georgian monarchy from Germany), English Architecture witnessed a profound shift in country house design from the compact and square-ish form of the fortified Elizabethan and late-medieval country house to the more open and less compact plan of the Baroque and later Palladian country house. This shift too in design followed a new embrace of the aesthetic relationship between country house and its surrounding, bucolic landscapes. The objective of this animation sequence is to visually illustrate these aesthetic and architectural changes. Click to watch the video above, or watch the slideshow automatically play below. This animation sequence is part of the progression to my degree in Architectural History & Theory from Oxford and Columbia University. Music: Franz Schubert_ Piano Trio in E Flat, Op. 100. Link to soundtrack. Link to powerpoint presentation here. Creative Commons permission is granted to download and circulate this video for non-commercial purposes, provided attribution is given to Myles Zhang. Read more about this project here and here. The Eiffel Tower was built during 18 months – between August 1887 and March 1889. This film shows the construction sequence, starting with the foundations et ending with the completion of the cupola. I downloaded Sketchup to create the computer simulation, and the post-production was made with iMovie. This model and video represent about two days work, or twenty hours. The source file for the model was downloaded here from the Sketchup 3D Warehouse, a database of free architectural models. Or, to view this model in virtual reality, please click here. The historic construction photos featured in this video were downloaded here from the Eiffel Tower’s Wikipedia page. And the blueprints consulted to create this animation are from a 2002 reprint of the Eiffel Tower structural plans. Around 1175, work begins on the Norman church – a simple structure with choir, nave, and tower between. Here we see the structure being erected from east to west. Notice the round Norman windows. By 1200, a small side chapel is added to the south of the tower. An aisle and entrance foyer on the south are also added. These changes require demolishing part of the existing structure. By 1250, the side chapel is demolished and replaced by a north transept, south transept and expanded chancel. By 1400, a crypt is added and the tower extended up. At this point, the architectural style changes from Norman to Gothic – from round arches to pointed. The local cloth merchants also construct a guild chapel – detached from the main church and built at a slight angle. By 1475, the guild chapel is partially demolished. On its foundations the Lady Chapel is built. Meanwhile, most of the remaining nave is demolished to construct two aisles on either side of the nave, a larger west window, and new clerestory-level windows. Two chapels are added on either side of the choir as well as a 3-story entrance tower. Neither of these additions are visible from this angle. This completes the construction sequence of Burford Church. We are now circling around the church – working our way clockwise. The film below is a brief visual analysis of the church’s architectural fabric. Through my analysis, I seek to understand the following: What is the visual language of Burford Church? What aspects of medieval social and cultural history can be deduced from the church’s decoration? And, in the absence of a written historical record, how can we detect the sequence in which the church was erected on the basis of architectural fragments alone? View from main street of Burford toward the church. West façade on left and the Lady Chapel on right. Norman era entrance to the church, dating from around 1175. Door from churchyard to chancel. As the apotheosis of Gothic architecture built during the 13th century, Amiens Cathedral is a dynamic and living structure. As the ninth largest Gothic cathedral in the world and one built in relatively short span of time, Amiens Cathedral exhibits remarkable stylistic unity throughout. Alongside the Parthenon, Amiens is taught each semester to several hundred students in Art Humanities. This has been a course required since 1947 of all undergraduate students in Columbia University’s Core Curriculum. This cathedral and the animations I created are currently used in classroom instruction. My objective is to recreate Amiens Cathedral as it appeared in the 15th century. My method is to build an accurate computer model of the entire cathedral, accurate to the inch, photo-realistic, and fully interactive. My hope is to find new and creative ways to engage students and visitors with this work of architecture. The final video sequence is in two parts. One, a three minute construction sequence of the cathedral’s erection between 1220 and 15th century, which has been viewed over 10,000 times on YouTube. Two, an eight minute fly-through of the finished work of art. Viewers approach the cathedral through the narrow medieval city streets and circumnavigate the exterior from bird’s eye and ground level. Viewers then enter the cathedral and are guided through the complex interior spaces. This trilogy is complemented by historically appropriate music from 13th century French composer, Pérotin and 15th century composer Josquin des Prés, who is incidentally also used on the Music Humanities component of the Core. Amiens has undergone significant revisions and the destruction of almost all its original stained glass windows and large parts of its nave. Through digital modeling, it is possible to restore the structure to its idealized appearance as its initial architect intended. Through video, we can recreate and expand the intended audience of this building, recreating digitally the experience of pilgrimage. Through virtual reality, we can encourage new ways of engaging with art and architecture. A building is dynamically experienced as a sequence of sights and rooms. A research text about such a building, however, can only capture a limited amount of a structure. Photography, computer simulations, and film are, by comparison, dynamic and sometimes stronger mediums to communicate the visual and engineering complexity of a building. This project seeks to capture that dynamism through a visual, auditory, and user interactive product. The nuances of gothic, in particular, are ideally conveyed through the creative use of computer simulations and interactive graphics. Students can download this model and freely edit, revise, and explore from their personal computer. Over 1,000 students and scholars have downloaded and 3d printed this model, which is currently being used by students at Reading University (UK) to study acoustic archaeology. This model of Amiens Cathedral is built with free computer modeling software called Sketchup. Sketchup has a wide range of drawing applications, architecture, interior design, and civil engineering. And, for computer modeling software, it is remarkably easy to use. With just a few commands, such as draw, pull, animate, and toggle, students and teachers unfamiliar with the program can build their own models in minutes. 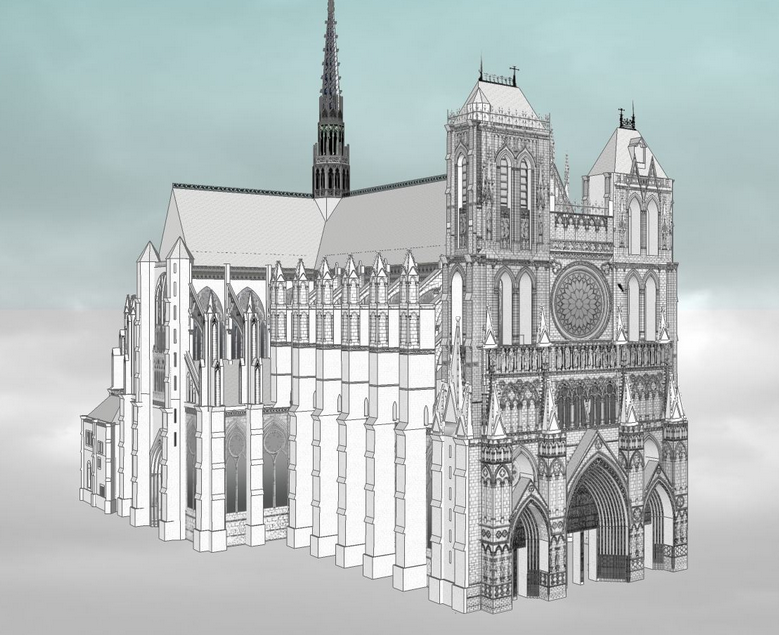 I hope this project will provide a meaningful and engaging way to explore Amiens Cathedral in the digital age. Watch the two films below, followed by links to explore this model in virtual reality. I am further expanding upon this work for my senior thesis and by building computer models for Columbia’s Media Center for Art History. I have also constructed computer simulations for the Eiffel Tower’s construction sequence and of a small parish church in Burford, England. This project would not have been possible without the invaluable and expert guidance of my faculty mentor and professor Stephen Murray, who taught me in the Fall 2016 Bridge Seminar Life of a Cathedral. This project is also featured here on Columbia University’s website. A video lecture about the technical workings of this project is also available here. A guided tour of Amiens with music composed by Perotin: Viderunt Omnes, most likely composed in 1198, twenty-two years before construction started on Amiens. Viewers approach the cathedral from the west, as pilgrims would have in the Middle Ages. They then circle above and through the complex system of flying buttresses that support the cathedral. The animation finishes by viewing the cathedral from below the foundations in an abstract fashion; starting from the concrete ground-level view of the pilgrim, the animation becomes increasingly abstract and digital. This video was posted by the Media Center for Art History at Columbia. The third video is the most abstract in the trilogy. Here, I have juxtaposed interior and exterior views of the cathedral, exploring the relationship between interior and exterior spaces. The sequence opens and closes with an abstract and animated cross section of the cathedral from below. Music is by Josquin des Prés: Mille Regretz. In addition to viewing digital cathedral in animation, viewers can navigate the cathedral for themselves. 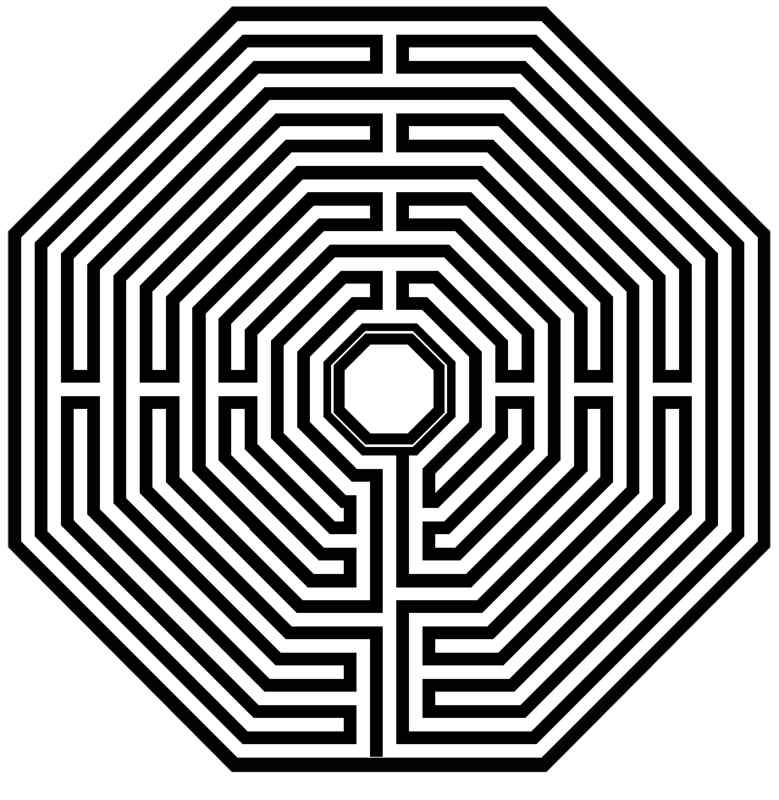 Here is a model of a single bay of the nave of Amiens Cathedral, with labyrinth below. I have imported actual images and textures into the model to create a photo-realistic effect. Click on individual numbers to see the names of the corresponding components of a medieval cathedral. Or orbit around this model to view from different angles. 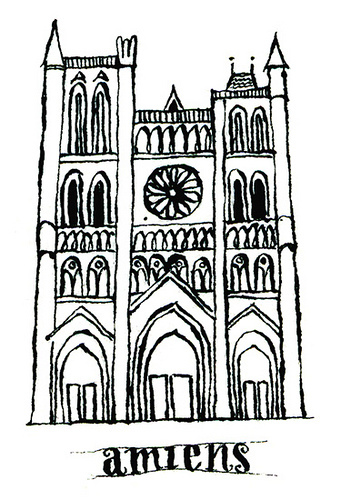 To learn more about this animated glossary of Amiens Cathedral, click here. Please be patient while this model loads. Click and drag mouse to navigate around structure. Shift click to pan. Click the cube icon on the lower left hand corner of window to view in full screen. If you are on your tablet or smart phone, click the optical icon to view this model in virtual reality. 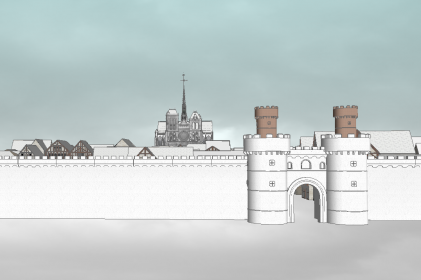 I have uploaded just the exterior of Amiens for online viewers. Unfortunately, due to file size, it is not possible to view the entire model online. But, it is possible, to download this model to one’s computer and then edit in greater detail. Please be patient while this model loads. Click and drag mouse to navigate around structure. Shift click to pan. Below are a few film stills taken from the animation sequence of Amien Cathedral’s exterior. Hover over image to display caption. Click thumbnail to view high resolution image in gallery. We enter the city of Amiens from the east and pass through the medieval city gates. As we wind through narrow alleys, as pilgrims do, the cathedral peers over at us from above. As we approach, the cathedral’s imposing mass comes into full view. We are presented with the West Façade, nearly 120 feet wide and 200 feet high. We now circle the cathedral. North Transept and Fâcade. Film stills of Amien’s interior. Hover over image to display caption. Click thumbnail to view full size in gallery. Gallery is organized linearly to evoke the sequence of interior spaces. The Nave at Amiens, looking toward the choir. View of Choir from the Nave. View from Crossing, down the Nave and towards the West Façade. Computer modeling allows one to explore angles of view not possible in reality. Of particular beauty are the view of Amiens from below. With the layers of earth and foundation removed, one looks up the grid of vaults and the forest of columns. The view is simultaneously a plan of the cathedral and a worm’s eye view, simultaneously of a real cathedral and an imagined world. Amiens is at an apex in the development of Gothic cathedrals. The earliest cathedrals were modeled after Roman basilicas with two narrow aisles on either side of a long, rectangular open space spanned with wood trusses. This is best exemplified in the plan of Old Saint Peter’s Basilica in Rome. Later Gothic cathedrals in following centuries modified this simple model. The dimensions and height of the cathedral grew, alongside the complexity of its vaults, columns, and ornaments. As Elizabeth Parker argues in “Architecture as Liturgical Setting,” the form and floor plan of the medieval cathedral evolved in response to changes in the use of the church and the rituals of the Mass. Below are two animated videos illustrating the evolution of the Gothic cathedral: In cross section at left and in plan at right. Development of a cathedral nave from Early Christian to High Gothic. A process of evolution and synthesis. 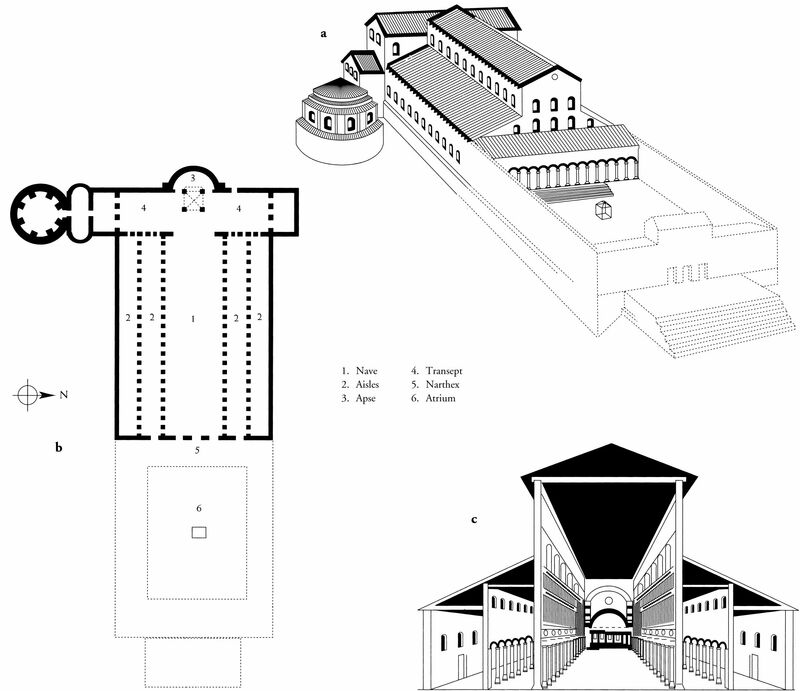 Development of the cathedral floor-plan over 1,000 years. Animation courtesy of Columbia University. This project would not have been possible without the generous help and expertise of Professor Stephen Murray at Columbia University’s Department of Art History & Archaeology. I am also indebted to Center for Career Education for funding this project via its Work Exemption Program. This project was inspired by a similar video trilogy from the 1990s about Amiens Cathedral: Revelations. As Newark celebrates the 350th anniversary of its founding in 1666, I created this series of drawings based on historical images and maps of Newark’s downtown. The above video briefly summarizes 350 years of Newark’s history in two minutes. The sound track accompanying this video was assembled via free audio clips from Freesound. As Newark develops from a small town to a bustling industrial metropolis, the sound track shifts from recordings of quiet woodlands to the din of the vibrant city. And as time passes, the skyscrapers we now see in Newark’s downtown gradually rise. History is learned textually through reading books, newspapers, and original documents. But, history is experienced visually and acoustically in a way that engages all the senses. History is dynamic, vibrant and three-dimensional, but it is recorded via two dimensional means. This brief history of Newark aims to visually and acoustically represent history as a living and fluid process of transition and change. My aim is not to comprehensively represent Newark’s history but to offer insight into the scope of feel of this storied city’s history. As Newark looks forward to the future, it stands on 350 years of history that shape the social, economic, and political forces that drive this city forward. A 60 hour time lapse of New York City’s Chinatown, accompanied by the Chinese song: Feng Yang (The Flower Drum). 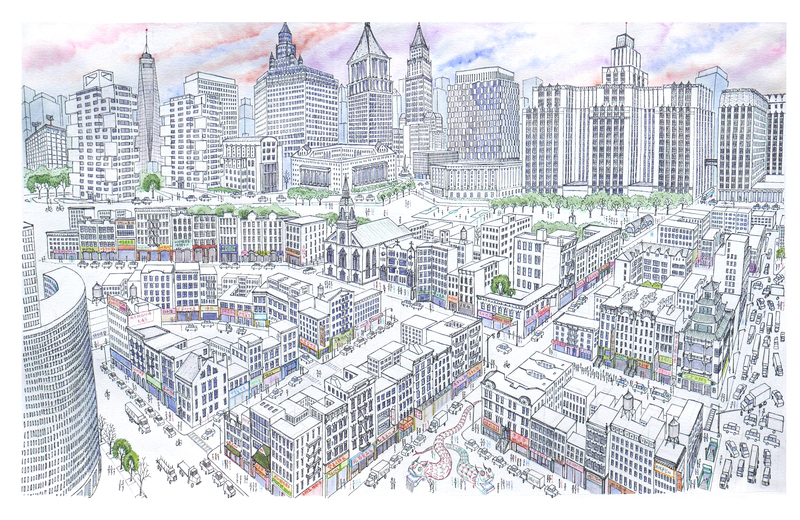 The original watercolor measures 26 by 40 inches with the tenements of Chinatown in the foreground and the skyscraper canyons of Lower Manhattan rising above. View of Chinatown bounded by the Bowery, Canal Street, and Columbus Park. 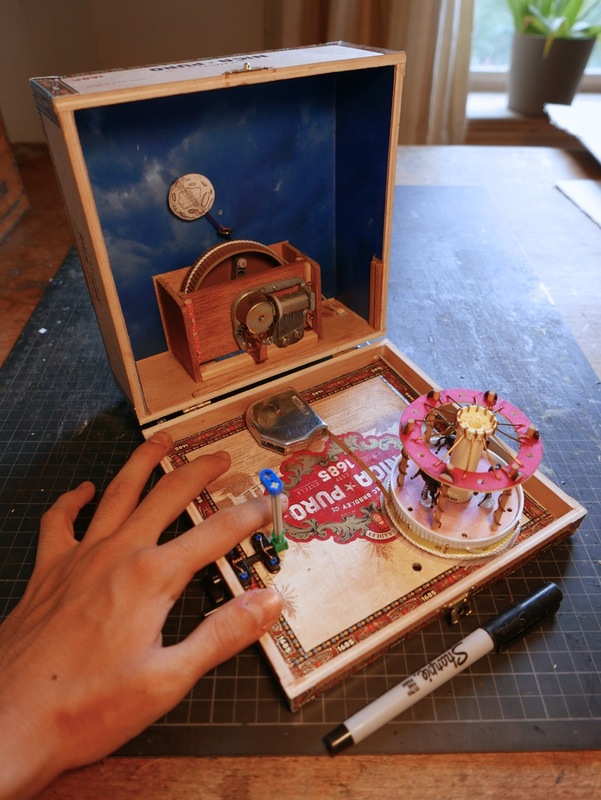 A wind-up music box featuring Jane’s Carousel along the Brooklyn Waterfront. When closed, the antique cigar box measures a mere 7 by 7 by 3 inches deep. When open, the Brooklyn Bridge and historic Jane’s Carousel fold out. The carousel spins to the tune of the music while the moon gently slides across the night sky. Materials: $4 cigar box, $5 wind-up music box, electrical wire (for trees), plastic lids for wheels, string (for motion), tape measure (for spring), tin foil (for water), and thick paper. Jane’s Carousel with my hand and a pen for scale. Dimensions: 7 by 7 by 3 inches. Growing up in Newark, I was inspired and saddened by my inner city environment. I am inspired by Newark’s hope of renewal after decades of white flight, under-investment, and urban neglect. But I am saddened by the loss of my city’s historic architecture and urban fabric to the wrecking ball of ostensible progress. “Renaissance City” depicts the Newark of my childhood with garish signage and decayed structures blanketing my city’s architecture in a medley of color and consumerism. In the summer of 2014, I built a model of New York City containing many of the city’s landmarks, skyscrapers, and a bevy of subway cars. This creation measures a mere 28 by 36 inches and is made entirely of wood, paper, and plastic. I stroll and try to identify the passing languages. Spanish in the outer boroughs. Polish in Greenpoint. Russian in Brighton Beach. Cantonese in Chinatown. French and German in SoHo. Reading “Here is New York” by E.B. White, I realize how little New York has changed in the past 60 odd years. Sure, the streets, cars, and tenements are different. But the essential spirit of dynamic and diverse urbanism remains. Here is New York. To read more about my walks in New York, click here. Growing up in inner-city Newark and attending school in suburbia, I have always wondered how these two environments were so distinctly different. How could so many cultural and socioeconomic differences exist in communities only a few miles apart? Furthermore, how did the suburban environment of my school effect the urban environment of my home? I have spent much of my life walking around New York City. And, the layout of this metropolis’ streets has always interested me. I relish in discovering new ways to walk between two places and in finding new streets I have never seen before. Inevitably, I ended up asking myself the following question: How does the layout of New York City streets reflect its history and heritage? 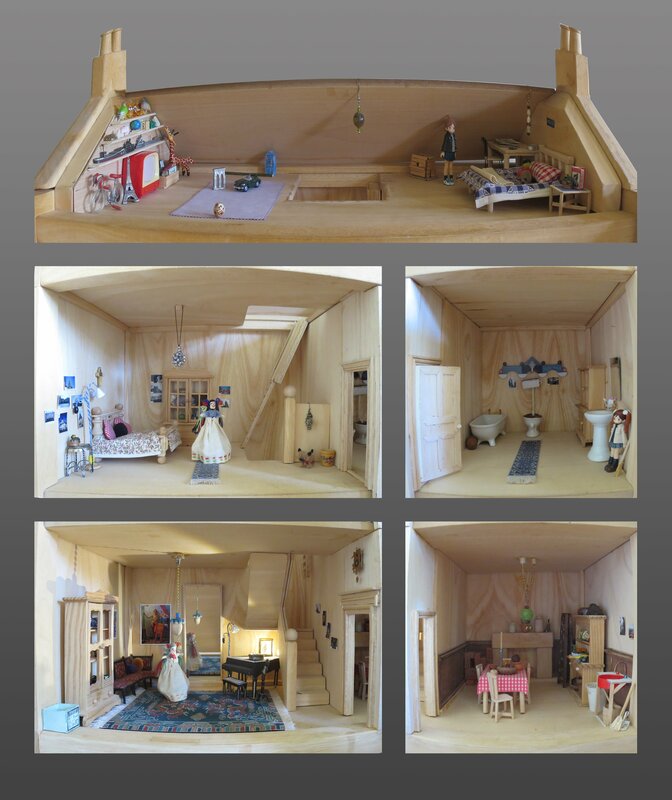 Over the years, I have gradually constructed a small dollhouse. Using balsa wood and cardboard, I have constructed the numerable pieces of furniture, many of which are the size of a matchbox. Odds and ends (many from my sister) such as bottle caps, cloth scraps, and earrings complement the intricate displays. Visiting China, I was shocked by the massive reach of globalization. On the train, I witnessed an endless treadmill of mile after mile of identical crops, villages, and cities. The polluted skies and downcast weather hinted at the relentless combine of economic growth. I swore to myself that such a sterile environment was fit for helpless ants. Returning home, I earned greater appreciation for my own artistic creations. They seemed so much more innocent, smaller, and quainter. I had something independent of “the combine” I could call my own. No matter how much the volatile world changed, my art would forever remain the same, my Unmanufactured Landscapes locked in time. On the speeding subway, the chaotic city passes by. At each turn of the screeching train, I behold new sights. A colorful whirlwind of life. At each new tunnel, I wait for the burst of light at the other end. It is a journey in a nutshell. And then . . . there is the expectation of the next journey. To learn more about this creation, click here.